Toshiba this month announced that it had started sample shipments of the industry’s first automotive grade embedded UFS storage devices for ADAS and infotainment systems. The new eUFS chips offer capacities from 16 GB to 128 GB (with a 256 GB option coming in Q2 2018), can handle extreme temperatures and support numerous features designed to improve their reliability and ensure consistent performance. 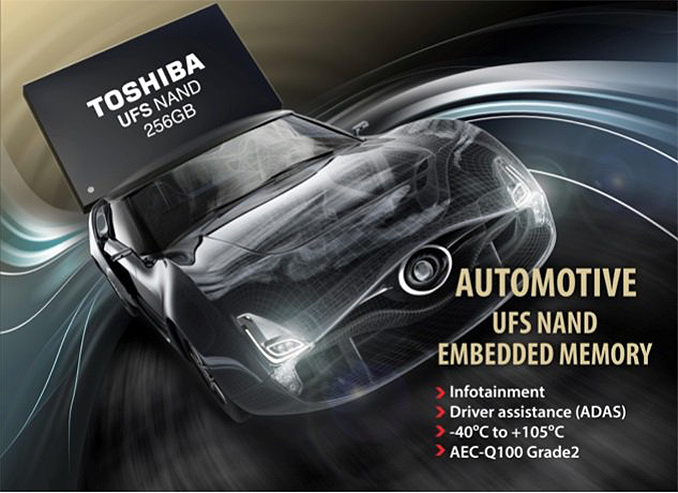 The Toshiba eUFS storage devices for automotive applications are based on the company’s proven 128 Gb MLC NAND flash made using 15 nm process technology as well as an in-house developed controller. The devices are compliant with the UFS 2.1 HS-G3 specification, so they use two full-duplex HS-Gear3 lanes with 5.8 GT/s data transfer rate per lane and can offer a theoretical maximum bandwidth of 1200 MB/s. Toshiba does not share actual performance numbers of its eUFS devices (other than saying that sequential read performance of its 64 GB eUFS device is 170% higher than that of its 64 GB eMMC device) and given that it also does not disclose details about its controller, one can only wonder which of the solid-state storage solutions can actually hit the peak interconnection speed. 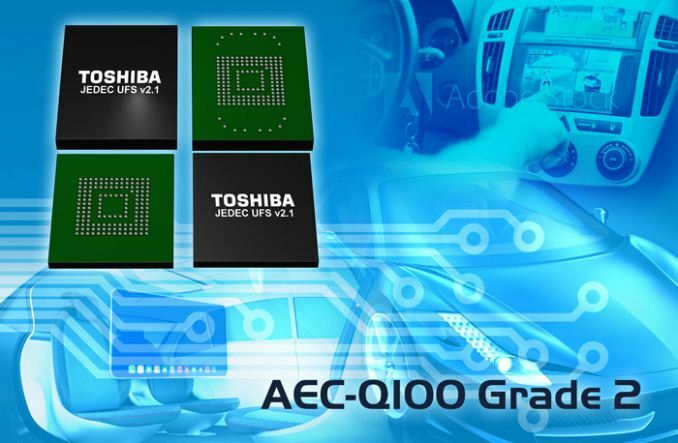 Toshiba’s eUFS devices are AEC-Q100 Grade 2 qualified, and can operate in extreme temperatures between -40ºC and 105ºC for prolonged amounts of time. Furthermore, they pack a number of features to improve general reliability and endurance, courtesy to the new controller and some other enhancements. In addition to performing regular NAND management (bad block management, error correction, wear leveling, garbage collection, etc), Toshiba’s eUFS controller monitors such things as P/E cycles endured by the cell, temperature and some other (which Toshiba does not disclose) and reports them to the host processor that may take some actions if needed . For example, if the built-in sensor detects that the temperature of the device exceeds 105ºC, it reports it to the controller, which starts to throttle the device to reduce the temperature and passes the notification to the host SoC for further actions. The controller also automatically performs the “refresh” function to extend data retention by moving data from cell to cell to keep charges at decent levels. Samples of Toshiba’s eUFS automotive-grade storage devices are available to interested parties. Meanwhile, Toshiba intends to add a 256 GB eUFS solution (based on the same memory and controller) to the lineup sometimes in Q2. Since vehicles take a long time to develop, it will be a while before Toshiba starts commercial shipments of the products. "Don't superconducting magnets work down near zero?" I believe that article refers to the application of strong magnetic fields (above the "critical magnetic field" of superconductors), not to their critical temperature (Tc), which is what the question was really about (with superconductors allowing the *construction* of "superconducting magnets", rather than being inherently magnetic - since they are diamagnetic). How about mechanical stress on the materials?